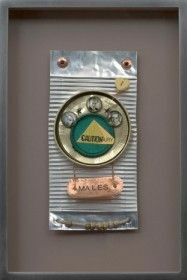 “Caution” Girl Scout badge, aluminum, brass, and buttons with small photographs of famous dangerous men. Signed and dated on front with letter press. Bronze frame.